PROSPECTIVE BUYERS, DID YOU KNOW YOU CAN BE AS YOUNG AS 40 YEARS OF AGE TO LIVE IN THIS COMMUNITY! AND CHILDREN 19 YRS & UP CAN RESIDE WITH YOU! *2 NEW LAYERS OF COATING ON FOAM ROOF JUST COMPLETED JUNE 5 2018 W/5 YEAR WARRANTY***NEW HVAC 2017, NEW ELECTRICAL PANEL & BREAKERS 2017.Turn-key, & ORIGINAL OWNER! -Welcome to this meticulously maintained home with fantastic floor plan AND large lot! This Cul-De-Sac home has one of the largest lots in the community. 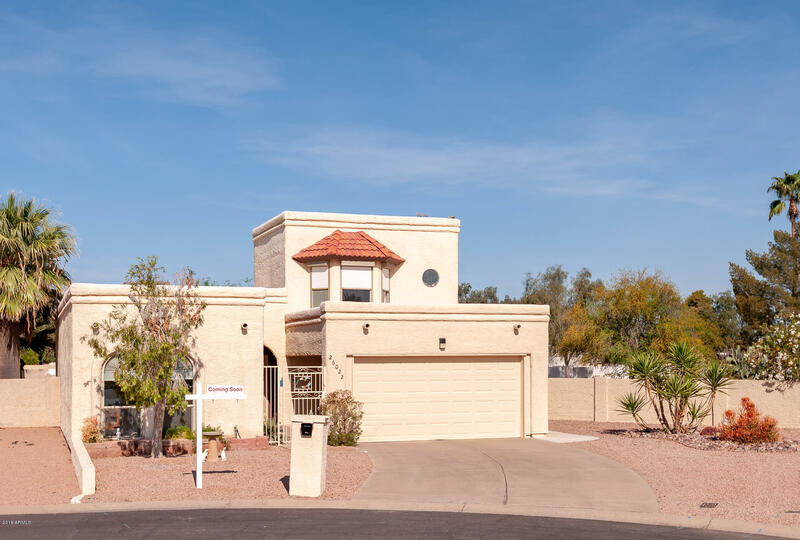 The home is private and quiet with 2 Master Suites (split) downstairs and the GUEST SUITE (3RD MASTER) has walk-in closet & conveniently located upstairs with full bath for privacy! The Master Suite (downstairs)-has a walk-in closet, updated bathroom w/double vanities/sinks & skylight for natural light. Master suite also has access to covered patio & backyard. Master bedroom also has roller shades on sliding door. The kitchen, & all 3 bathrooms & tile flooring have been recently updated in the last few years along with 4 NEW windows & A NEW French door w/built in blinds. The triple pane French door lead into a cute screened-in porch, perfect for dining & entertaining! Most of the home's interior was FRESHLY painted this April 2018, along with all the block fence. Did I mention the Arizona Garage (perfect for ease of opening car doors, ease of entering & exiting your vehicle). This well cared for home even has new smoke alarms w/10 year battery warranty. Come see this well loved home with it's fabulous floor plan and amazing lot. PLENTY OF ROOM FOR GRANDKIDS, PETS, & A POOL IF DESIRED! PRIVATE, QUITE, LOW MAINTENANCE LOT! The formal living room & formal dining room are currently being used at a LARGE FAMILY/GREAT room.